James Sheehan | Simpson, Tillinghast, Sheehan & Araujo, P.C. James Sheehan's practice includes providing legal advice and counsel to the firm's institutional clients, and civil litigation in the following areas of law: construction, administrative, condominium, property, contracts, commercial and real estate. 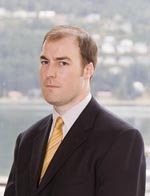 Mr. Sheehan has litigated disputes involving contracts, construction claims, property rights, partnership dissolutions and disputes, corporate governance disputes, and other general and complex litigation before courts and administrative agencies throughout Alaska. Mr. Sheehan was born and raised in Fairbanks, Alaska, and received his Bachelor of Science degree in Business Administration from Clarkson University in Potsdam, New York. After receiving his Juris Doctor in 2004 from the University of Denver Sturm College of Law in Colorado, Mr. Sheehan returned to Alaska to practice and settle in Juneau. Prior to joining Simpson, Tillinghast, Sorensen & Sheehan, P.C., Mr. Sheehan clerked for the Honorable Patricia Collins, Superior Court Judge for the State of Alaska. Â Mr. Sheehan is a member of the Alaska and Juneau Bar Associations, and is admitted to practice in all relevant state and federal courts in Alaska. While attending Clarkson University, Mr. Sheehan played on the Men's Division 1 Ice Hockey Team, serving as team captain his senior year. After graduating from Clarkson, Mr. Sheehan played professional hockey for a year in the minors with the Bossier-Shreveport (Louisiana) Mudbugs of the Central Hockey League. Mr. Sheehan is married and has two children. 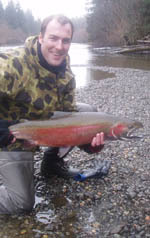 He enjoys boating, fly-fishing, skiing, playing hockey and spending time with his family exploring Southeast Alaska.